In a move that is long overdue, Hawgleg Publishing is proud to announce that long-time friend and supporter, Paul Mauer, has officially joined Hawgleg Publishing as a full partner. Paul will be responsible for wearing multiple hats in the small organization, chief among them being project management, proofing, product development and representing Hawgleg Publishing at conventions and playtests in Washington state and its surrounding areas. 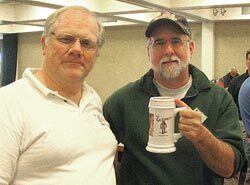 At Enfilade 2006, Paul Mauer with "The Last Man Standing," Paul Jarvis, who happily holds his Cold Death Stein for outlasting the other varmints in a rousing game of Gutshot. Future projects include the Gutshot campaign guide, Adventures on the Outlaw Trail, Night of the Living Deadwood and an anime-themed game co-authored by Mike Mitchell and Paul Mauer (more on this, later). Additionally, there are a few “secret” projects under development by the partners; details will be released closer to their release. Paul echoed his partners’ enthusiasm. "I’m really looking forward to the next 12 months,” Paul said. “With the three of us working together, I think we’re going to accomplish some amazing things."